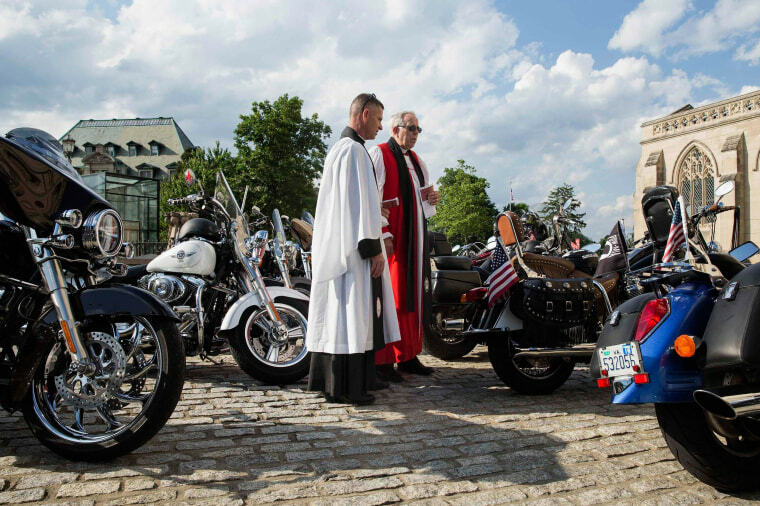 Holy water fell on Harleys when the priests from the Washington National Cathedral blessed motorcycles and welcomed members of Rolling Thunder on Friday ahead of their annual ride on Memorial Day weekend. Tens of thousands of motorcycles, many ridden by U.S. military veterans, will roll into the National Mall, the nation's symbolic front yard, on Sunday in a bold show of support for American prisoners of war and those missing in action. The rally takes place every year on the eve of Memorial Day. Above, members of the Episcopal Church look at motorcycles before the "Blessing of the Bikes" ceremony at the National Cathedral in Washington.